Are you looking for a really special gift? We're happy to work with you to create a much-appreciated present for your loved one with a gift certificate for any desired amount. Easy payment via Paypal or check, with blank certificate sent to you or completed version sent to the recipient you specify. 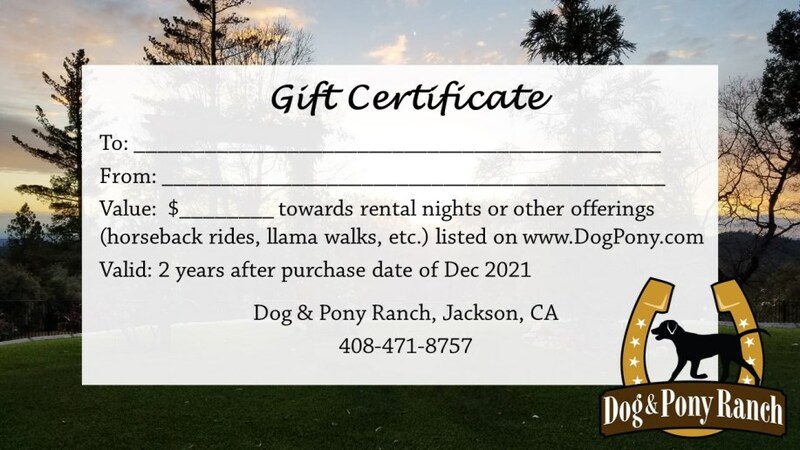 Dog & Pony Ranch nightly rates range from $249 (weeknight in quarters for a couple) to $359 (weekends in standard guest house for 6 people) plus tax and cleaning, so we recommend selected a round amount ($50, $100, $300, etc) to be used within the next 2 years. We are happy to customize with bundles of t-shirts or logo merchandise, or other special surprises for the recipient like flowers upon arrival or grourmet dinner delivered from a local restaurant. Just let us know how you'd like to delight your special someone. Avoid the malls and just contact Cyndi and let us know how we can help you make a very memorable gift!